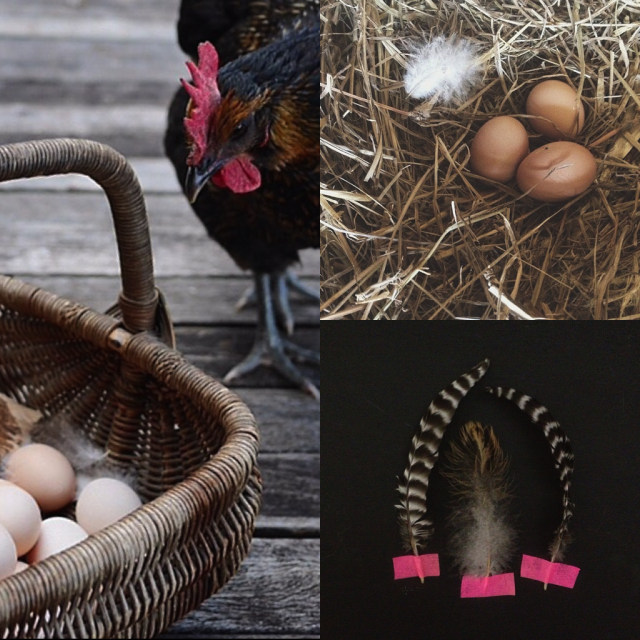 When I wrote the post Chickens and the Egg, I started thinking about all the friends I admire who are raising chickens in a beautiful intentional way. One that shines ever so brightly is a little friend that we know from Australia named Suri. 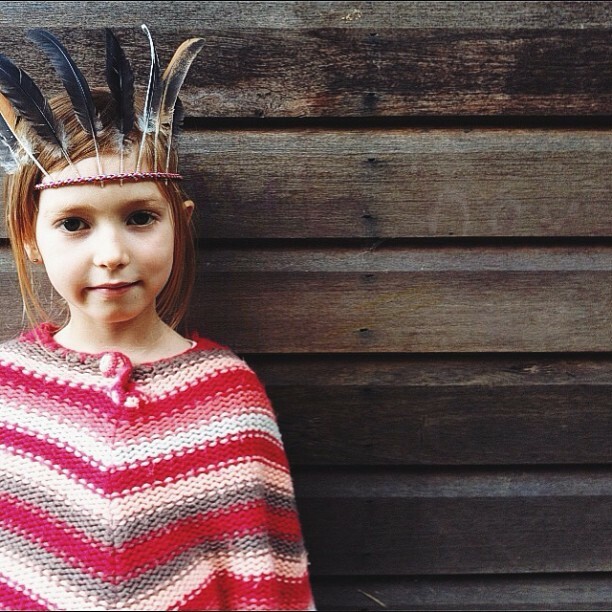 You may know Suri from following long with her family over at Sang The Bird. I just adore Leah’s creative wholesome instagram feed of the same name. Leah and I are kindred spirits, having attended the same prenatal yoga classes in a small rural coastal town in NSW, at the same time, with Maya and Suri being very close in age. With conversations around the dinning table about loving chickens, the girls and I were inspired by all the beautiful photos of Suri’s life with her flock. Elle thought she would like to ask Suri a few questions about having chickens. 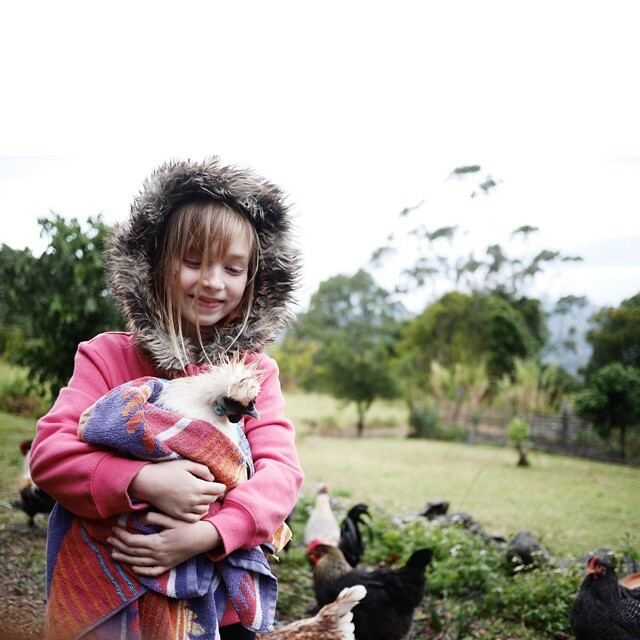 I wrote to Leah, who kindly told us a little about their hens and roosters, and Suri answered Elle’s questions. 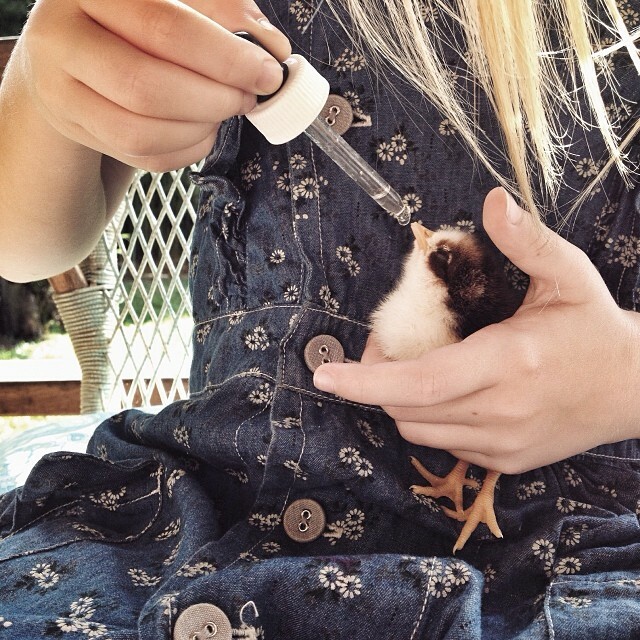 Leah: “About 5 years ago my partner arrived home with four 16-week-old chickens. We.were.smitten. From the moment they arrived they were loved. Funny little creatures each with their own personality. Some loved to be handled (read cuddled) and the one that didn’t, loved to follow me around as I did my outside chores. They quickly became part of our family. Over the years they have begun breeding, and each time a chick hatches we are joyous. It is a little miracle. Suri has been able to experience hand raising several chicks which is pretty special, the moment they are born they are tiny, wet and so fragile. But with love and care, within 24 hours they are little chirping fluff balls, it is pretty amazing. There is work involved to keep our hens and roosters healthy and happy, Suri has afternoon chores that include feeding them, giving them clean water and collecting their eggs. Sometimes she is resistant but more often than not she wants to be outside with them. Elle’s questions to Suri about having chickens. Elle: How many chickens do you have and how many eggs do they give you a day? Suri : We have 26 hens and 3 roosters. One of the roosters is still little, we helped him hatch out of his egg when he couldn’t get out. We sometimes get 14 to 18 eggs a day. Our littlest chicks will start to lay in a few weeks. Their eggs will be tiny and really cute. I love to make baked egg custard with my mama. Elle: Do they lay eggs in a nest or do they lay eggs anywhere? Suri: They lay in their nesting boxes. Except for Cloudy. She likes to lay in the laundry sink, but if we are doing the washing she lays in a little cubby my dad made her. Sometimes she still lays in the sink and gets wet. Most of our chickens make a really loud clucking after the lay, they are really happy about it. The other chickens cluck along too. Elle: What do you feed your chickens? Suri: We feed the hens and roosters laying pellets and the chicks have chick starter. It is like crumbly pellets. They like eating our compost. Especially spaghetti. They are outside all day and eat lots of grass and insects and worms. 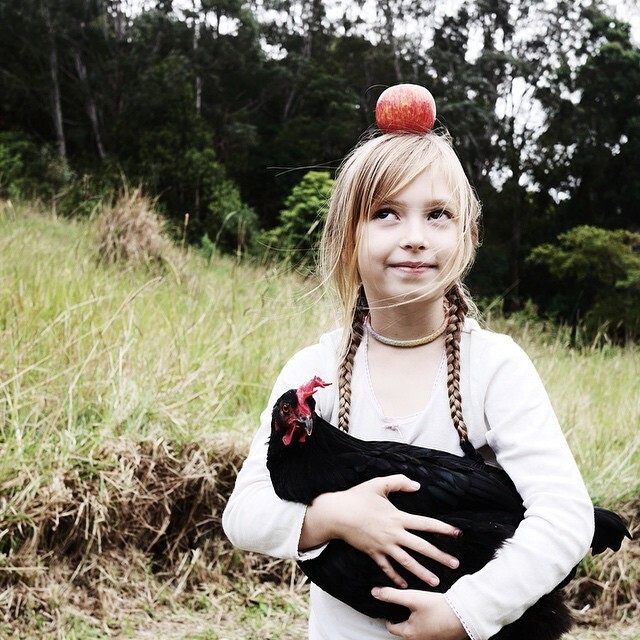 Elle: Are your chickens happy? 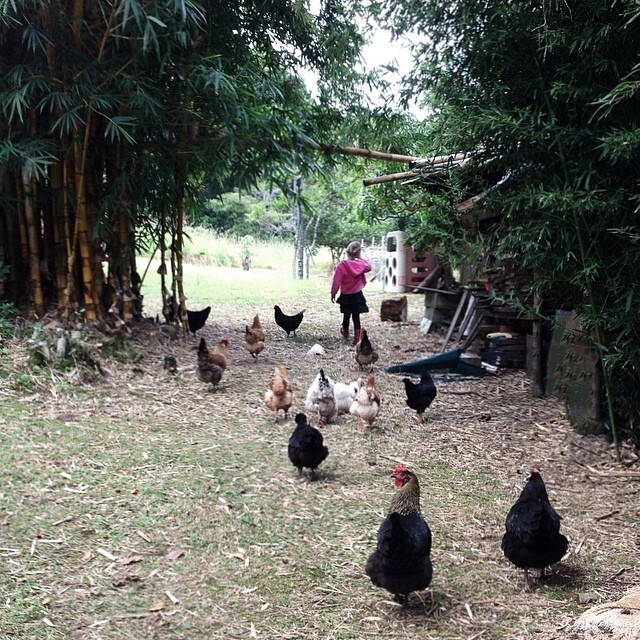 Suri: Yes our chickens seem to be very happy. They know that I love them. Some come up for cuddles everyday. They get to free range outside everyday. It would be sad to be a chicken locked in a small cage. Elle: Have you ever seen one of your chickens lay an egg? Suri: Yes, it is a bit funny watching but it is also interesting. When the egg comes out it is warm and a bit sticky feeling. My favorite thing is to collect the eggs in the morning when they are still all warm and cosy. Chickens have very fluffy feathery bottoms that keep the eggs warm. This is really important if they get broody. 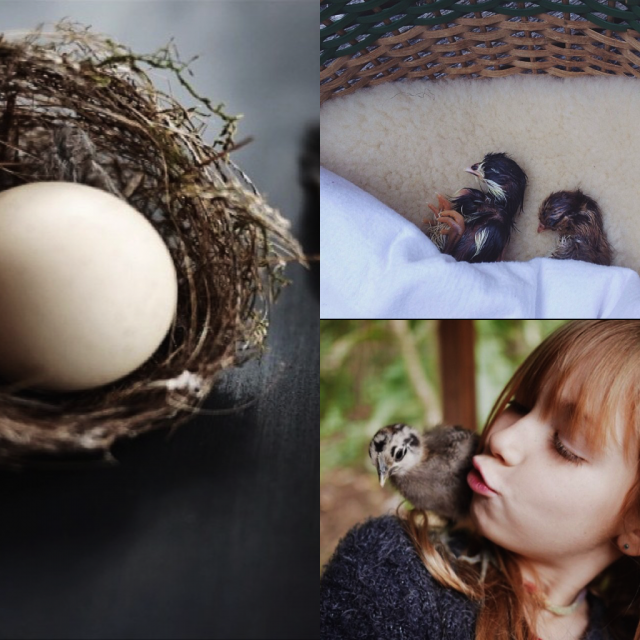 Broody means when they want to become a mama, they sit on fertilized eggs and a chick grows in the egg because it stays warm underneath the chicken. 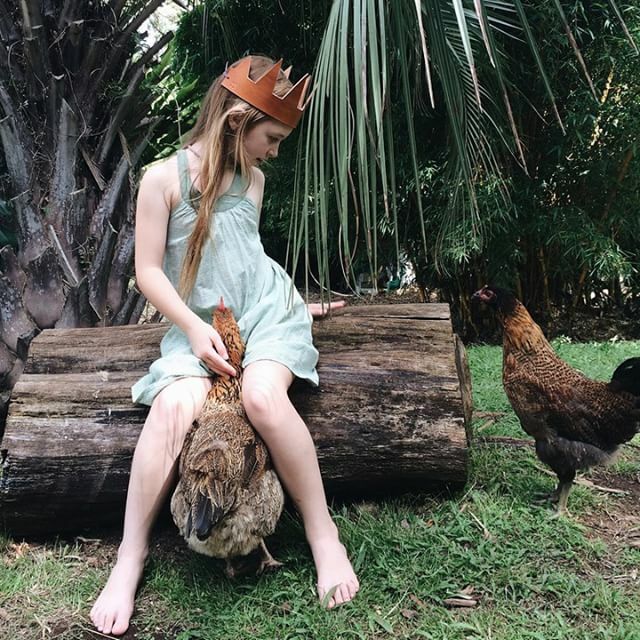 Elle: What is your favorite thing about having chickens? Suri: I like that they follow me around, and I like finding and collecting their feathers. I am very happy having chickens as a part of my family, I like cuddling them. Elle: Do you think you will have chickens still when you grow up? Suri: Yes, because I really love them. If I live in town I might have just 2, they need space and grass to free range to grow up to be healthy, happy chooks. Thank you to Leah and Suri, be sure to follow along their beautiful life Sang The Bird. This entry was posted in E N V I R O N M E N T, I N T E R V I E W and tagged animal, chickens, ethical. Well, she is adorable! Fun story!